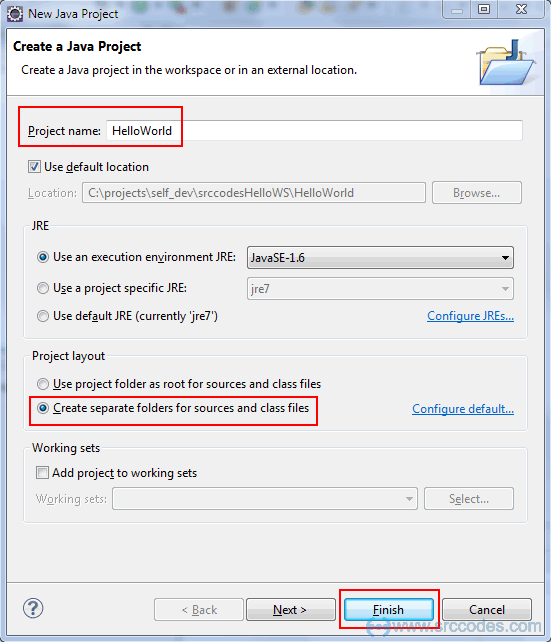 This article describes how to create a "Hello World" java program using Eclipse IDE. This program will print "Hello World" in the console. JDK Installer : Download from JDK 1.6. Eclipse Installer : Download from Eclipse 3.7. Select from the menu File --> New --> Java Project. Enter "HelloWorld" as the project name. Keep rest of the settings as it is as shown in the following screenshot. 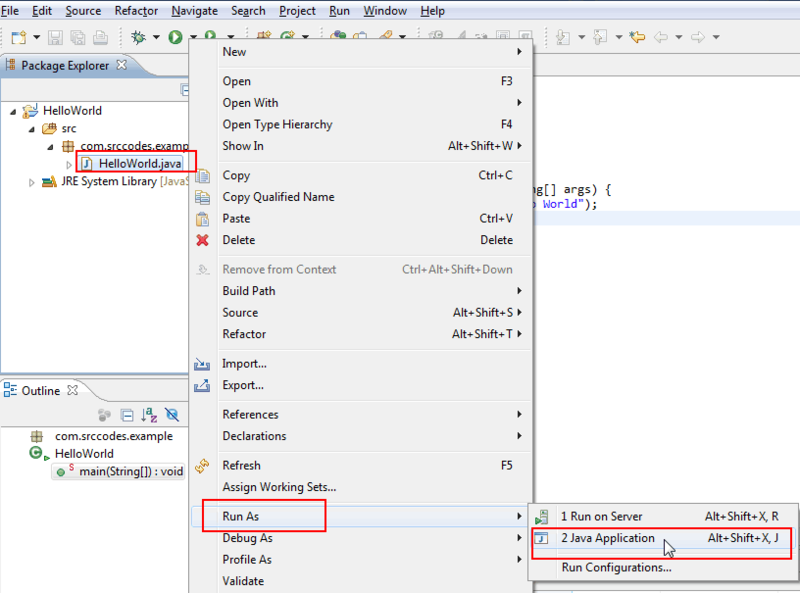 Click "Finish" button and Eclipse IDE will generate the java project automatically. Right click on 'src' folder and select from context menu New --> Package. Write 'com.srccodes.example' in the 'Name' field and click "Finish" button. Right click on 'com.srccodes.example' package and select from context menu New --> Class. Write "HelloWorld" in the 'Name' field and select the check-box for 'public static void main(String args)'. Click "Finish" button. 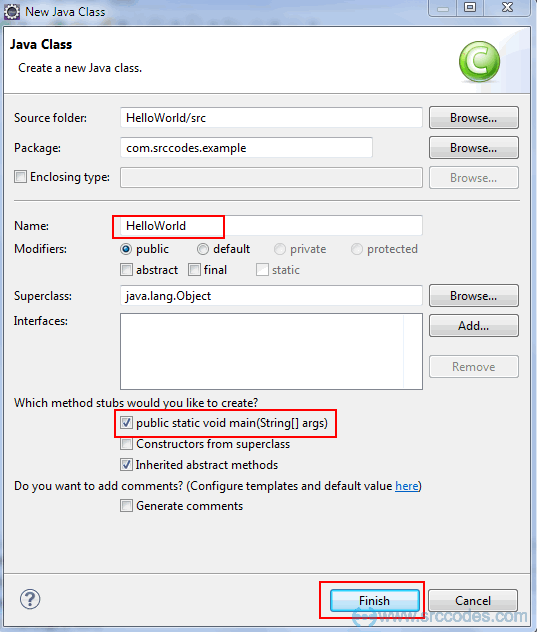 Eclipse will generate a java class and open the same in the java editor as shown below. 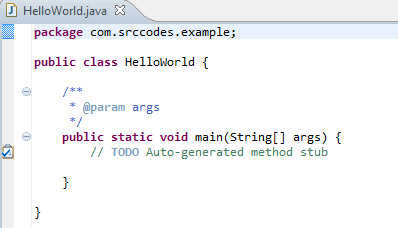 Edit the generated 'HelloWord' java class as per the following code. 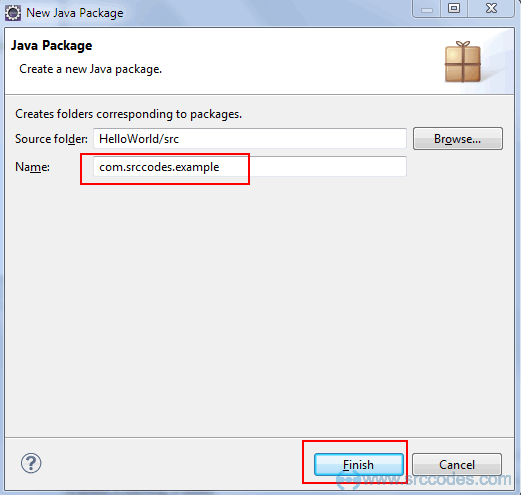 Right click on 'HelloWorld.java' and select from context menu 'Run As' --> 'Java Application'. Your code will print 'Hello World' in the eclipse console.